Simplify flat grading jobs with the new Bobcat box blade, available in two models: the 2134 mm box blade and the 2134 mm laser box blade. The laser box blade comes standard with a fully integrated laser control system. The laser box blade has a grade accuracy of +/- 7-mm and is designed for the precise grading required for most flat work applications. For job-site preparation, use the box blade without the laser engaged to fill in low spots and carry material to bring the surface close to grade, and then use the laser to complete the final grade. 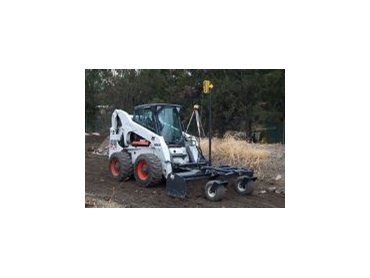 The box blade without the laser is designed for rough grading and landscaping applications. It is operated with switches mounted on the loader's steering levers for fingertip control of the blade raise-and-lower function. Both heavy-duty box blades have a reversible cutting edge, grading width of 2134 mm and come standard with foam-filled tyres for added flotation.